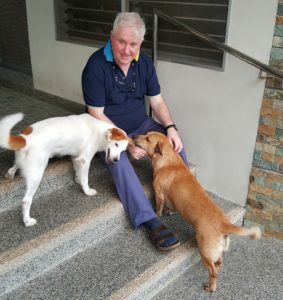 Fr Raymond Husband returned to Ireland in 2017 to take up the role of Office Manager with the Irish Mission League and the Far East magazine. Before that, he was a missionary in the Philippines. 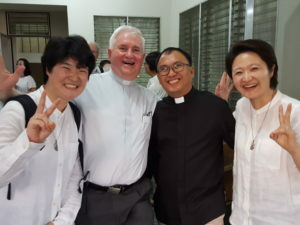 He talks here about his vocation journey and calling as a Columban missionary. I grew up a couple of miles outside Navan. Growing up I would have known the Columbans very well because my grandparents lived about 10 minutes down the road from Dalgan Park. There were Columbans calling in and out of my grandparents’ house, including Fr. Tom Kennedy, who was a great friend of my grandfather’s. Also, the late Fr Paddy Reilly, who was another great friend and Fr. Tom Hanahoe, who was a very good friend of my aunt’s and officiated at her funeral. When I was coming to the end of primary school I would have thought about entering the priesthood. Back then, Brothers from religious orders came around recruiting in the primary schools for minor seminaries. My mother’s response was ‘absolutely no way’, 12 years of age was far too young. So I went to secondary school but I only did a year there because I was bullied. After I left school, I got a job in Navan Carpets, where I worked for seven years. I had a great time there, looking forward to the weekends and a few beers with friends. At around 18 or 19 I began thinking about my life and wondering if this was the direction I wanted to go. I began to realise that there was more to life than just this. But, as I had left school without any qualifications, the first hurdle to get over was how to be accepted into a seminary without qualifications. I started studying. I worked during the day and then went to night school and did my Leaving Cert in Geography, English and Maths. 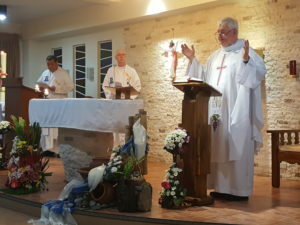 It was around that time, I began to get involved in the charismatic renewal and that is how I got to know some of the Columban seminarians as well as Bishop John Howe, Fr Pat Campion and Fr Kevin O’Boyle. They were the men who inspired me and I began to think again about missionary priesthood. 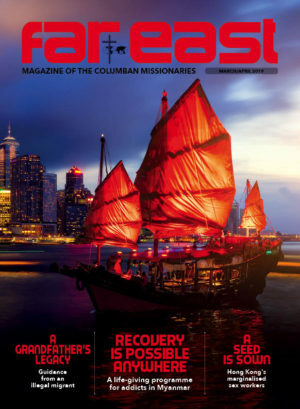 I was in contact with a number of missionary congregations but the one that I felt most at home with was the Columbans. There was a naturalness, a down to earth acceptance of people, and their stories inspired me. I finally made up my mind to apply to the Columbans when I was around 20 in 1978. I was sent to a place run by the Kiltegan Fathers in Scotland where I crammed five years’ study for O Levels and A Levels into two years. It was a beautiful part of the country and though it was very hard work, in many ways it gave me a great grounding in life. There was a balance of academic study, sport and manual work – you got out every afternoon and got your hands dirty doing things like cutting trees, laying paths and picking potatoes. I came home and joined the Columbans in Dalgan and was in the class of ’81. Eight of us entered and three were ordained, Padraig O’Donovan, John Collins and me. After philosophy and theology in Maynooth, I was sent on overseas training to Mindanao. From the very beginning, my grá was always for the Philippines. I was hoping that I would be sent there. I was attracted by the stories I heard about it and to the people, whom I knew were warm and welcoming. I was also aware of the social deprivation in the Philippines and the poverty and martial law. I felt, this is where I can find my home and this is where I can minister and be ministered to. I spent a year in the city of Iligan in Mindanao followed by a few months in Midsalip. It was a very critical time because Marcos was toppled from power while I was there. So I was there for the people’s revolution and it was a very exciting time. I was in Midsalip with Marcus Keyes and Frank Nally. There were some Columban Sisters living in the mountains outside the village. 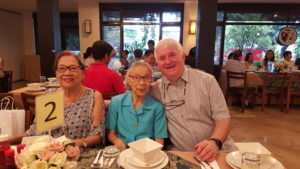 I really admired them, they were brave women because there were still parts of the military that were very loyal to the Marcos regime and they were suspicious of the Church and the Midsalip Christian community there. They would have seen them as subversive and a threat. I remember shots being fired over the rectory where the priests lived as an act of intimidation. After Marcos was overthrown, the presidential palace, which was called Malacañang, was opened to the public. I remember visiting it and seeing the beauty of the rooms but it was such a contrast to the people I had lived and worked with and how they lived. I was about 25 at the time and there was an old man in front of me and at one stage he broke down and started crying. I asked him what was wrong and he explained that he was a public health doctor living in rural Lete. “I spent all my life trying to work for the welfare of the people and I was always told there was no money; I was always told we have no budget for this and we have no budget for that. Then I come here and see that this is where the people’s money has been wasted and spent.” Those words had a profound effect on me. I have never forgotten that old doctor and how he was so moved that he actually cried when he saw the waste and the luxury. I came back to Ireland in 1987 and got a Bachelor of Divinity from Maynooth and I was ordained a deacon. I worked for six months as a deacon in Armagh Cathedral parish and for six months as a priest. I really loved Armagh and the parish of Tullysaren, it was a great learning experience. But then I returned to the Philippines in 1990 and after some time I got my own parish of St Joseph’s in Sincaban. I was there for almost five years. It was a small parish by Philippines standards; we had 16 barrios or chapels and a parish team. We all worked hard trying to build up the local community and to deal with real issues that surfaced for the community. A lot of people were tenant farmers and there was a growing ecological awareness about the impact that the destruction of the forest was having on their lives. We were trying to make the link between faith, scripture and the reality of life. They were great people and I learned a lot about how, even in the face of suffering, people can be so resilient. 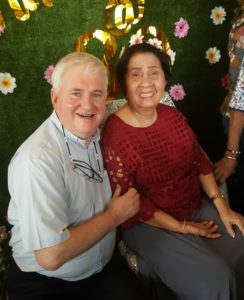 I was in that parish for almost five years and then I went to Manila as vice director to Colm McKeating; he had been my formator in Maynooth. 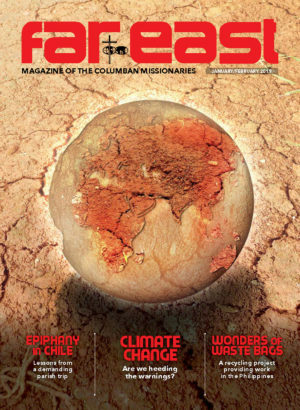 During that time I had responsibility for the mission magazine – Misyon – doing the job that I am doing here in Dalgan now. I was also in charge of our sick and elderly priests and I found that a very fulfilling ministry. I was always amazed at how these older men faced illness and death – men like Paul Cooney who embraced all the suffering he went through. I was there for six years, from 1999 to 2005, accompanying the older men in their illness as they moved towards death. I can only pray that I would have half the grace and half the faith that they had. Then I came home to Ireland to study at the Milltown Institute where I did a diploma in spirituality and then went on to do an MA in Christian Spirituality. My Mum got ill and entered the last phase of her life around this time, so I was taking care of her while trying to balance the studies. I was home for about five years from 2005 to 2010. On my return to the Philippines I went into formation with our seminarians. During that time, the programme went from being predominantly Filipino-based one to a more international one and we had students from China, Myanmar and Korea. More recently it has opened up to Fijian students. Our goal is to train men who can be secure in themselves, secure in their own culture yet not afraid to move out of it. As missionaries we go out, we don’t wait for people to come to us. We step out of our own culture, and out of our own beliefs at times to reach out to dialogue and to engage. We’re men with feet of clay. But as a way of life I have absolutely no regrets. It has been a wonderful life and I would do it again.